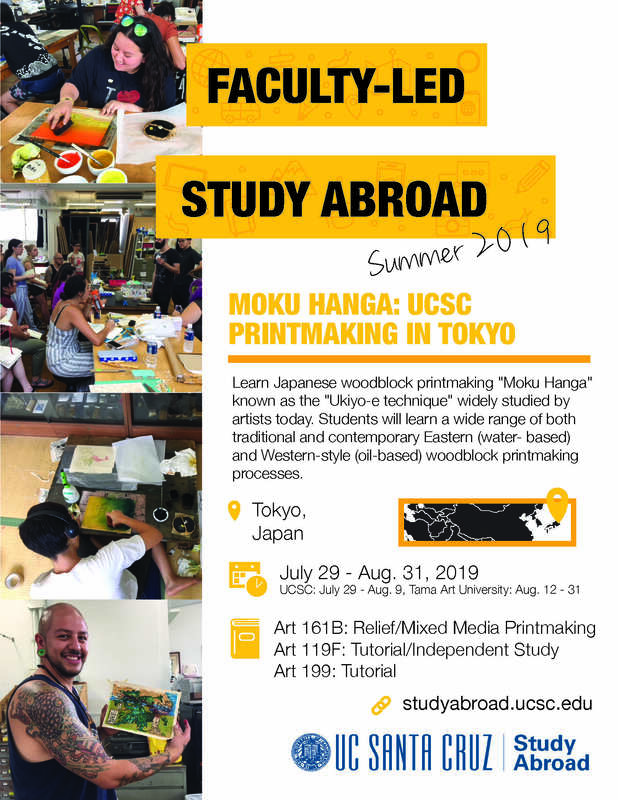 Join Faculty Director, Jimin Lee, and Study Abroad Program Coordinator and Advisor, Krissy Loveman, on Wednesday, Nov 28, 2018 12pm - 1pm (Seminar Room D-101) to learn more about the 2019 Moku Hanga: UCSC Printmaking in Tokyo program! On this program, students will learn Japanese woodblock printmaking "Moku Hanga" known as the "Ukiyo-e technique" widely studied by artists today. This five-week program will be taught first at UCSC (for two weeks) and then at Tama Art University in Japan (for three weeks). Classes will help stimulate and inspire art major students to prepare their artistic careers and expand their possibilities for study opportunities internationally. Classes will include field trips to local museums and galleries, hands-on workshops at a traditional paper mill (washi) in Tokyo, and interactions with local visiting artists, master printmakers and other Japanese students. Through various class activities, excursions, and cultural visits students will be exposed to diverse and multi-regional art practices that will broaden their perspectives and increase their understanding not only in the field of print media but in the larger contemporary visual culture.